Is it over yet? This was the question more and more on Halina and Riley’s minds as the punishing winter dragged on into early spring. Sledding had long lost its luster and heading outdoors requiring the increasingly tedious ceremony of boots, scarfs, hats, gloves and winter coats that—scuffed stained and torn—barely survived the season. Luckily spring break began with sunshine and warmer temperatures. It was still chilly out, but we began allowing ourselves to feel confident that winter was finally over. 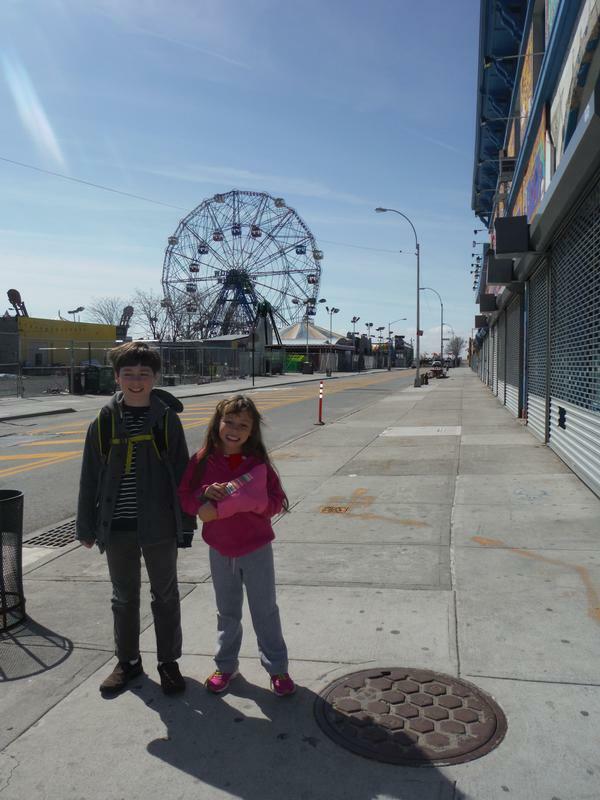 Almost as if to turn hope into reality, Halina, age 8, one day suggested we go to Coney Island. “But it’s too cold to swim and the rides won’t be open,” I said. However the little mermaid was unpersuaded. Even if she could not dive into the waves, build sand castles, or ride the Cyclone (which she could not do anyway last year because she was still too short), she just wanted to see the ocean, feel the sand, and smell the salt air. 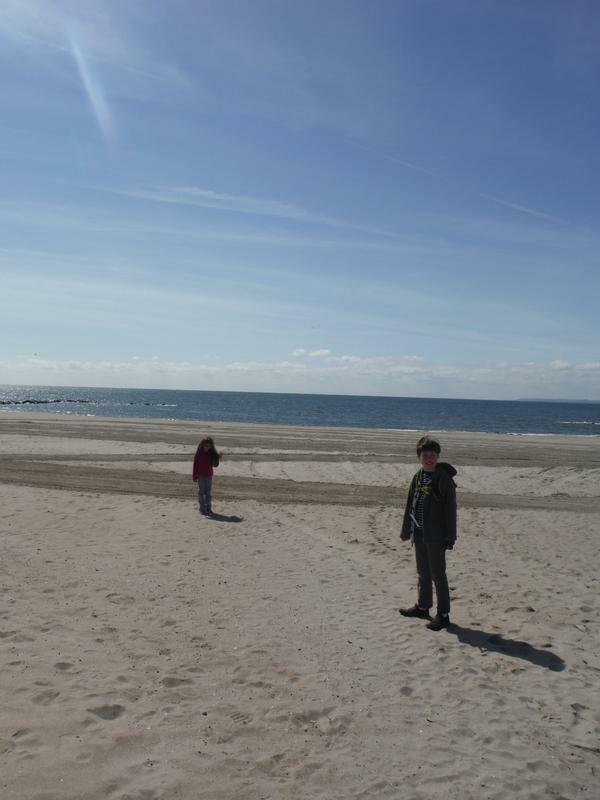 Luckily Riley, age 11 who was agonizing over the fact that this was his last spring break as an elementary schooler, was by no means opposed. Even better, he was intrigued by the idea of walking to Brighton Beach at the other end of the boardwalk to look in the Russian stores. So one still slightly chilly day last week, off we went. 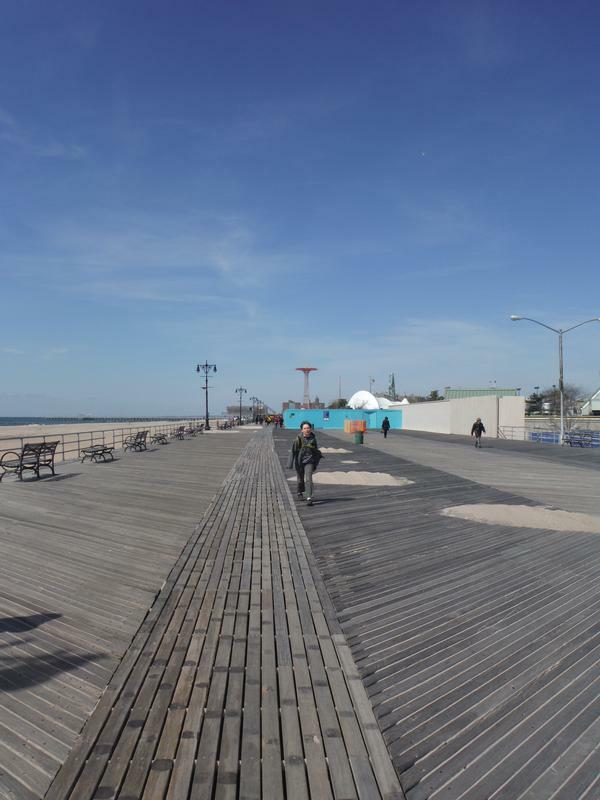 When we hopped off the subway at Coney Island the streets were more or less deserted. It was hard to imagine that in just a month or two they will be packed with beachgoers slathered in suntan lotion toting boogie boards to the beach. One promising sign was that the rides, though not open, were up and running for repairs and testing before the season begins. And once we hit the boardwalk, it was stunning. The wind coming off the water was cold and strong, but not anything like what it would have been like just a month ago. The sunlight was brilliant and the briny air smelled, if not just like summer, certainly close enough. Heading down the 2.5-mile boardwalk towards Brighton Beach the wind was against us, but that was no big deal. Sand had gathered in swirling piles in some places along the planks, making for a slightly unkempt landscape, but more than few beachgoers were enjoying the relative calm and isolation. Once we arrived in Brighton Beach we made a brief detour to do some shopping a few blocks back from the boardwalk along Brighton Beach Avenue, the main drag that runs under the elevated subway tracks. Here you can find Russian and East European delicacies such as caviar, cream and kielbasa—for prices and at a quality it is hard to find elsewhere in the city. It was also fun for the kids to hear people chatting in Russian, a language they are both starting to learn a bit in anticipation of a visit to that vast and fascinating land in the next few years.